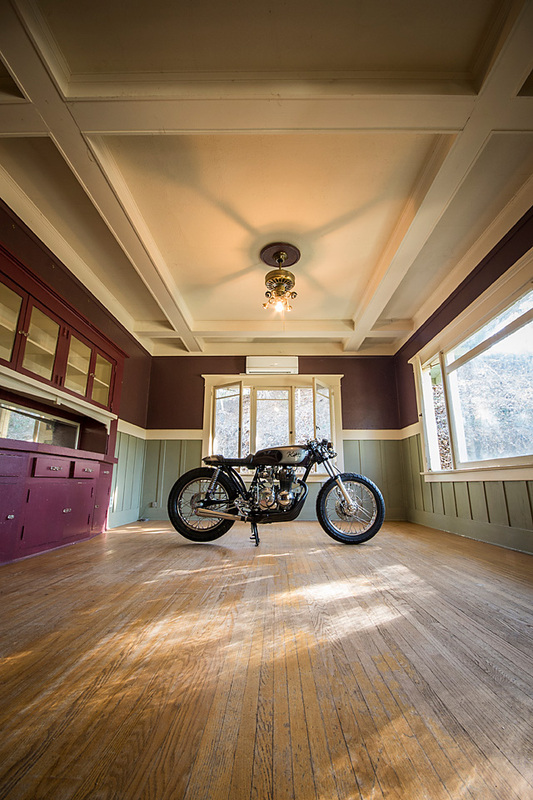 This bike was featured on Pipeburn.com (Click here to view) - Written by Martin Hodgson. But that has never worried Dustin; one of his great joys is not just customising bikes but taking old wrecks and breathing new life into them. 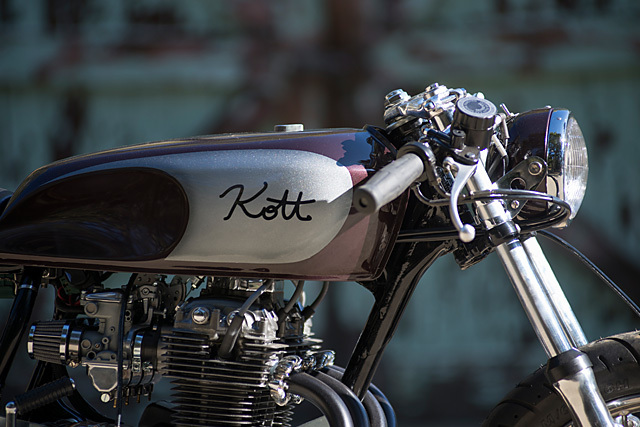 “This particular motorcycle was given to the shop by the long-time single owner, to not only restore the bike but to reimagine what it could become.” Despite the obvious sentimental attachment, consultation was left to a minimum so Kott’s ideas could flow. But first the bike was taken back to a bare frame so it could be built up again like new. The frame received a number of modifications to accept the changes that were to come. One of those was a switch from the stock tank to the more desirable CJ360 unit. But Kott didn’t just leave it as it came, his considerable metal work skills have again been put on display. The old tank is now arrow straight, has been reshaped to accept perfect knee dents and now fits the frame like a glove. “Our goal was to enhance what was already there with newer and more aggressive lines.” One thing that drew Kott to the CJ360 tank was it’s almost miniature 750SS lines that help to achieve some of those goals. Further to the aggressive and clean look is the clean-cut tail and shorter rear end. 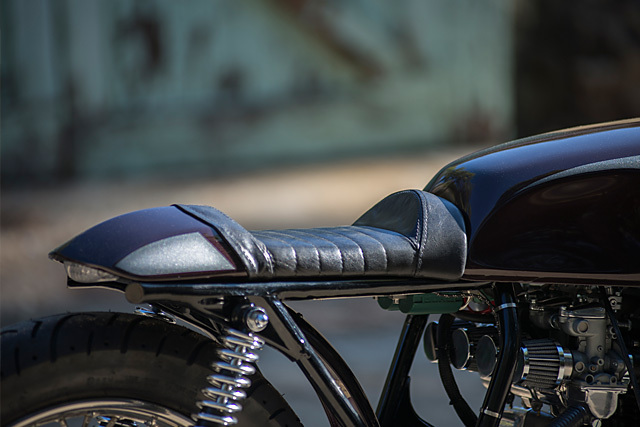 The seat is a signature Kott hand-built tail piece fabricated from round bar and sheet steel to match the tank lines brilliantly. With a slick bike taking shape, attention could turn to the engine that needed more than a little tender loving care. The square bore 408cc engine will happily rev to 10,000rpm and get there quickly. But for this particular example to do that Dustin had to treat the 2 valve head to a full top end rebuild. Externally the engine is now so clean you could eat off the thing. While a host of chrome parts, including the side covers give the cheap commuter a big dollar feel. The bank of four 20mm Mikuni carbs have been rebuilt, cleaned up and wear a little chrome of their own. The tops, the fuel bowls and the four individual filters all sport the shiny finish. But it’s the famous 4 into 1 exhaust of the 400F that truly takes the mechanical centre stage. Not only is it one of the most beautiful systems to ever roll off a factory floor, Kott’s taken it to a new level. Coated in a body matching colour it flows rearward to a smooth chrome muffler that almost seems to float. That’s thanks to some clever hidden mounts that secure the system but are almost impossible to see. Equally as important to the classic simplicity of the mechanical package is the effort Kott has gone to hide the wiring. “The most difficult phase of this build was in the new placement of the electronics and coils.” Now hidden under the seat and with much of the unnecessary accessories shown the door, the late ’70s bike takes on a timeless 1930s simplicity. But Kott also has an ability to re-imagine many of the existing parts to take on a whole new appearance and function. The foot controls are re-positioned on custom mounts with the cut down stock brake pedal a beautiful touch. Well machined components, exquisite linkages and brass bushing all combine to make for a brilliant singular part. The clip-ons bring the same level of style and sophistication, cheap Chinese copies these are not. They’re paired up with some classic black grips, minimalist buttons, a push-pull throttle and period correct master cylinder. But just the simple process of cleaning up the top triple clamp and polishing its finish transforms the once cluttered front end. That top clamp swings the factory front telescopic forks that have been rebuilt, polished and dropped through the trees. To ensure the bike sits flat the rear shocks have been swapped out for some classic British Hagon items. Their chrome finish is a perfect match for the heavily polished factory wheel hubs. While even the front brake caliper is now a mirror like finish and clamps a single drilled disc. The wheels have been relaced with new spokes onto brand new polished rims and the Kenda rubber strikes the perfect balance between form and function. There is no front fender but the neatly rolled numberplate support hanging from the rear axle tells you she’s ready for the road. “Without really conferring with the customer the ideas that reached fruition were praised and well received. Missing the mark or coming up with a design that was not a success is humbling to say the least.” However there is no reason for Kott to feel anything but pride as he once again turns out a remarkable classic custom. The larger bikes in the CB range might be easier to customise for a vintage look. But that Dustin Kott can take the built to a budget factory 400F and leave it looking this good is a testament to the skill of a man who lives to restore bikes with the eye and touch of master artist.